Unleash your imagination as you journey through the wide-ranging world of LEGO building. Students working in pairs will build models, and discuss the engineering science behind each. This fun, hands-on class shows students how engineering can be fun and silly, yet still educational. 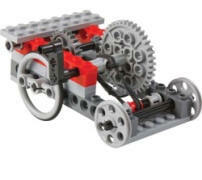 Students will then be challenged to improve the model and customize their creations. Possible models include never look back machine, skittletops, Do-Nothing Machine, Coat Hanger Daredevil, Trapdoor Cable Car Parachute Machine, Rubber band Racer, Balloon Powered Car, and other Crazy Action Contraptions.